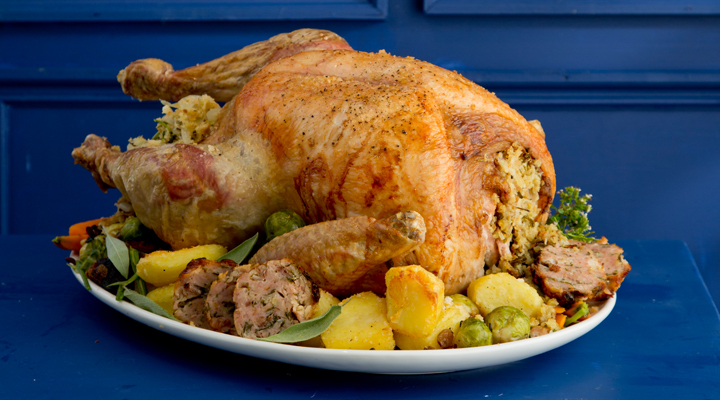 Impress your guests this Christmas with this simple, yet delicious Classic Turkey with Stuffing. Put the butter in a small bowl and mix in the walnuts and sage. Rub some butter underneath the turkey breast skin by lifting the skin gently with your hands and massaging the butter onto the flesh. Next add the stuffing to the turkey. Put the sausage meat stuffing in the neck cavity, then line the main cavity with some tin foil or parchment paper and loosely pack the traditional stuffing into the bird. Don’t forget to weigh the turkey again with the stuffing in it. Put the turkey on a large roasting tray and put in the preheated oven. Allocate 20 minutes per 450g and an additional 20 or 30 minutes in the oven. In total it should take about 5 hours to cook a 6.5kg turkey with stuffing. When a skewer is inserted into the meat nearest the bone on the leg, the juices should run completely clear. If you feel the turkey is browning too quickly, you can loosely cover the turkey with some tin foil for the first 2 hours. Allow the meat to rest when it comes out of the oven and carve as required.